Dorie Greenspan is a baking god in my book. I look up to her. 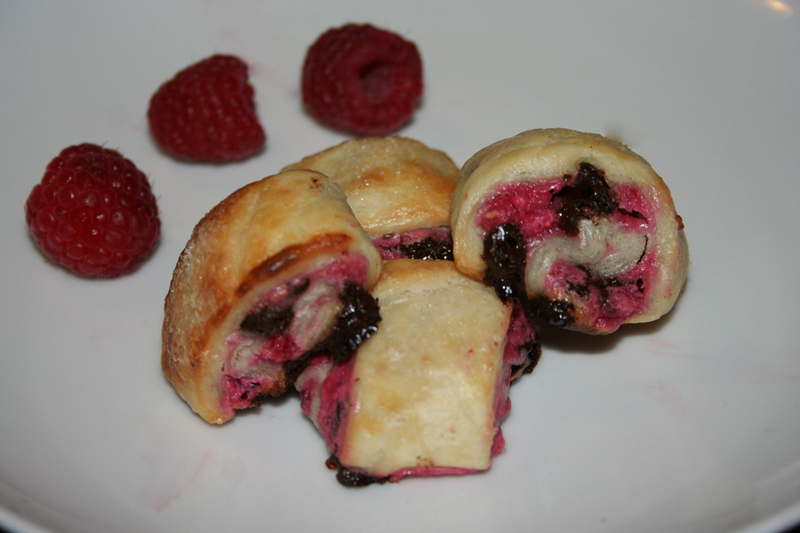 So when I was recently approached to adapt Dorie’s rugelach recipe with some fresh Driscoll raspberries, I got super excited. I jumped at the opportunity to check out her latest cookbook, Baking Chez Moi: Recipes From My Paris Home To Your Home Anywhere. And then it hit me. They wanted me to make rugelach. I’ve made rugelach once before, but only once. Rugelach meant that I would have to take out my rolling pin. You know how much I despise rolling out dough. But I’m doing it for Dorie. Because she’s a great teacher. So I got to work. I read and reread the cookbook and studied the rugelach recipe. Her dough recipe is so simple and comes together fast. I mixed up the flour, butter, cream cheese and salt in my food processor. It took just a couple of minutes. I formed the mixture in to two squares, wrapped them up in plastic wrap and then chilled for a couple hours. While the dough chilled, I made the filling. 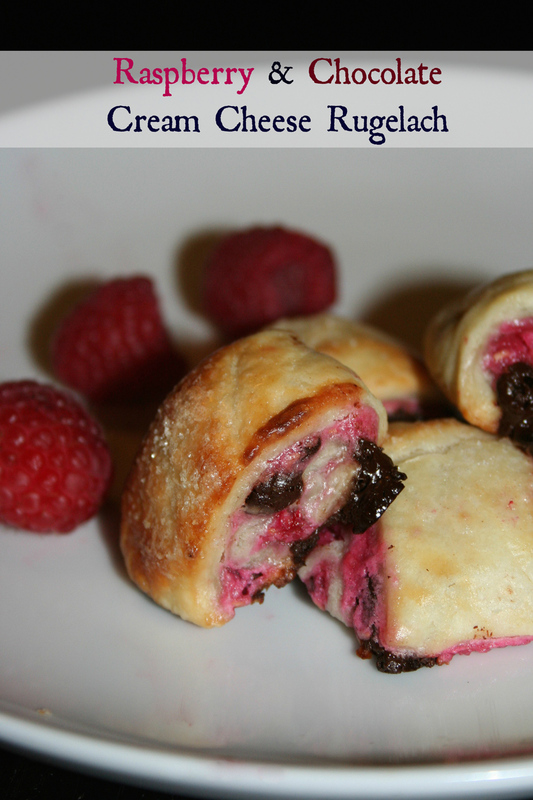 I knew that I needed to fill the rugelach with some form of raspberry and chocolate, but it needed to be different than the last time I made rugelach. I decided to make my filling using cream cheese, sugar, the fresh raspberries and some 72% dark chocolate. I’m so glad I went in that direction. Next, I reviewed her rolling technique over and over. To be honest, at first I doubted her method. With the first batch of the cookies, I stuck to the pie slicing method that I’d used in the past. Of course it didn’t turn out the way I wanted to. I relented and tried Dorie’s method of rolling rugelach. She recommends rolling the dough into a rectangle and slicing in half and on each half, filling and then rolling the long way. I froze the two long rugelach tubes for a little bit before slicing. They sliced beautifully once chilled. I baked the rugelach for around 15 minutes. Lo and behold, Dorie’s version came out perfectly. And that raspberry and chocolate and cream cheese filling? Amazing and rich. The perfect dessert. It meshes so well with the flaky and buttery dough. 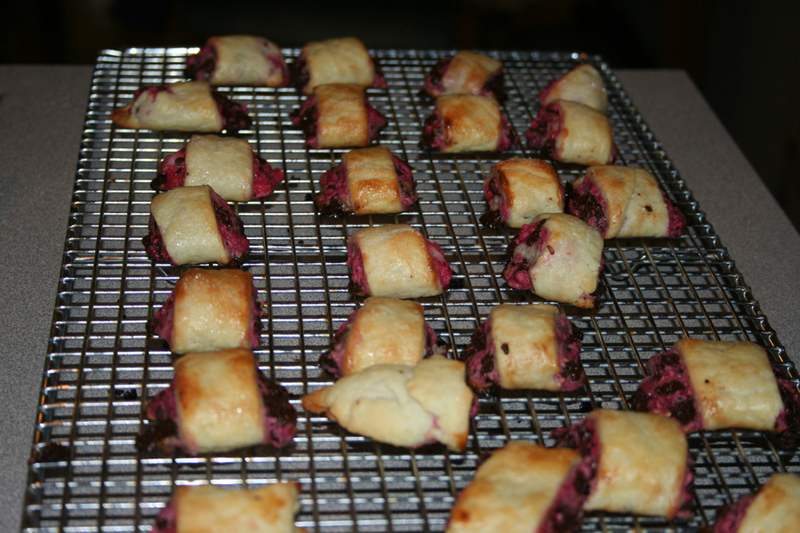 I am definitely making these rugelach again soon. I’m sure I will mix up the filling ingredients over and over again, but for now, this works for me. 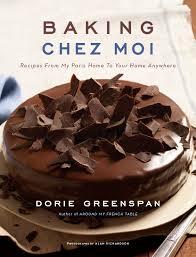 Thanks to the publishers, I have a copy of Dorie Greenspan’s cookbook available to give away. Please enter below! Cut up the cream cheese and butter in to chunks. Place the flour and salt in the bowl of a food processor. 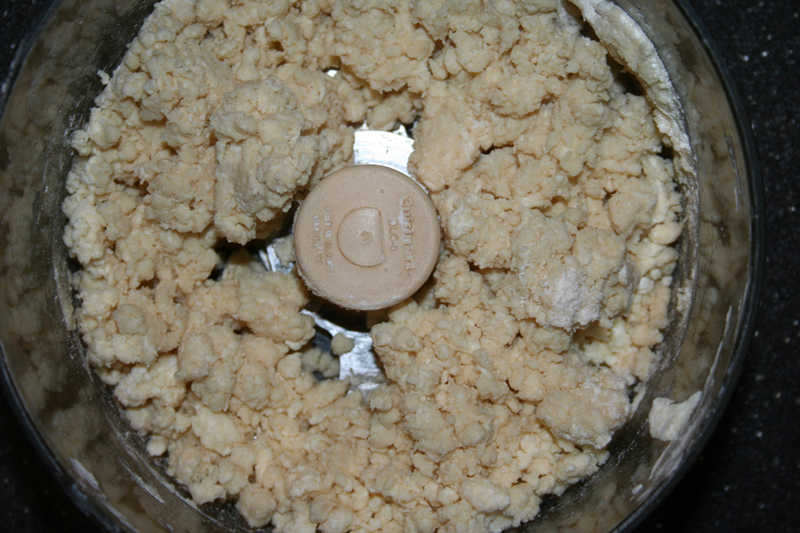 Add the butter and cream cheese to the food processor and pulse several times until it becomes crumbly. Don’t let it come in to a ball on its’ own. Transfer mixture to a floured board and form in to a ball with your hands. Separate in to two pieces. Shape each piece into a square and wrap in plastic wrap. Chill dough squares in fridge for two hours. 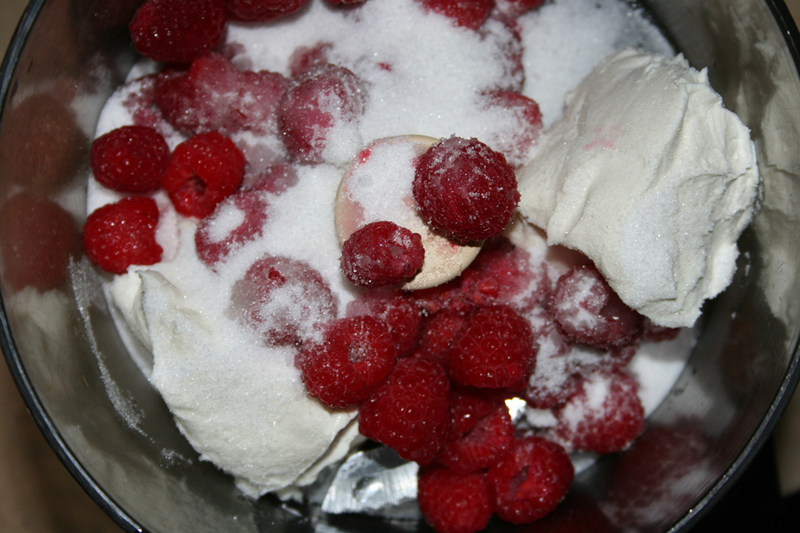 For the filling, place the cream cheese, berries and sugar in the food processor and pulse until combined. You don’t want the raspberries completely pureed – you want some pieces. Set mixture aside. Chop up the chocolate well. Set aside in small bowl. Take one square of dough out of the fridge. Move to a floured surface and dust the top of the dough and your rolling pin with flour. 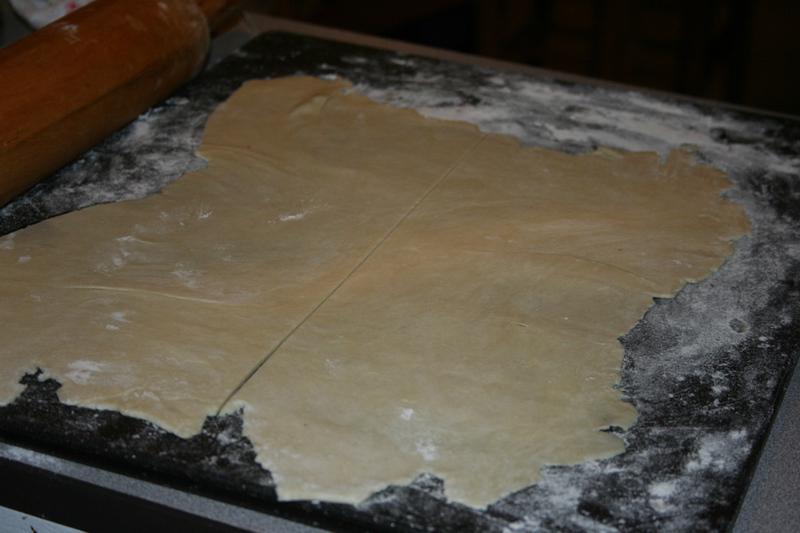 Roll out the dough to a 12 x 12 rectangle. Slice the rectangle in half to 12×6. Spread filling on rectangle, leaving one long edge without filling. Roll up the dough from that one edge. Roll it up jelly roll style, with seam side down. Transfer both rolls to the freezer. Once the oven is heated to temperature and the dough rolls are chilled thoroughly, remove the rolls from the freezer. Brush the top of the rolls with the egg mixture and sprinkle on some of the sugar. Repeat the process with the rest of the dough. So much about Passover, the customs and my memories – revolve around food. It goes beyond the foods that we aren’t allowed to eat. I’m always thinking about what we do and can eat. I find that the easiest part about Passover are the main and side dishes. It’s the desserts that are tough. What do you do when it seems like you can’t eat anything? We adapt. There’s always chocolate and fruit to fall back on. Every special meal must include chocolate. I feel like that is a written rule in my book. This tart that I am sharing with you reminds me of my mom’s flour-less chocolate cake that she often serves at the seder, along with some other chocolate treats I grew up with. One of my favorite flavor combinations is raspberry and chocolate. Growing up in Minneapolis, if someone brought the fabulous Raspberry Chocolate Torte from Gelpe’s Bakery to the house on Shabbat – everyone was happy. Another favorite that I remember as a kid, was the Raspberry Chocolate Chip ice cream from Sebastian Joe’s. All three of these fabulous treats were inspiration for this raspberry chocolate tart I am sharing with you. This tart will be served at one of our Yom Tov lunch meals, where we tend to feast on dairy. Happy to have a dairy dessert. Mix the almond meal, sugar and butter together in a small mixing bowl. It will be pretty crumbly. Press the mixture in to a tart pan. Try to get up the sides as much as possible. I use a non-stick pan and do not need to butter or spray the pan. I would recommend buttering the pan a little if it doesn’t have the non-stick coating. Bake the crust in the oven for about 18-20 minutes. Check to see if the crust gets too brown. Remove the crust from the oven and cool completely. Note: If you want to make the crust pareve, I would recommend using coconut oil in place of the butter. Heat up the heavy cream in a small sauce pan. Heat it until it just starts to boil and then remove from heat. Place the chocolate in a small mixing bowl. Pour the hot cream over the chocolate. Add the 1/2 teaspoon of salt. Let it sit for a few minutes. After a few minutes, whisk the chocolate completely. It should be shiny. It will thicken as it cools. Warm the jam in the microwave for about 30 seconds. Spread the jam along the bottom of the tart crust. Pour over the ganache filling and spread evenly with spatula. Chill in the fridge to set. Once set, garnish with some fresh raspberries. Note: If you want to make the filling pareve, I would recommend using coconut milk or the non-dairy whipping cream in place of the heavy cream. When I say I’m a hesitant baker, I really do mean it. I can tackle challahs and and make a mean oatmeal chocolate chip cookie, but when it comes to real baking – I get the jitters. I need good, easy recipes and techniques or a Betty Crocker mix to get me through the yummy sweet stuff. So, when “The Kosher Baker” by Paula Shoyer showed up at my doorstep, I was excited and nervous. I have a lot of cookbooks on my shelves, but very few baking books. I asked my daughter to pick out a few recipes. Then I sat in a corner and paged through the book – deciding what to make first. I was impressed by the variety of recipes in this book. From simple cookies and cakes to tarts and babkas to macarons and challahs. This cookbook has a baked treat for everyone. I love that right from the beginning, the table of contents breaks the recipes down by ease of preparation. It makes someone like me more at ease. I also love that this cookbook is dairy-free. It gives options for margarine and soy-based dairy alternatives, allowing the home cook to delve in to all areas of baking. Throughout the cookbook, you will also find that the recipe ingredients are not very complicated. Many of the ingredients are those that you already have in your home and the others are very easy to find in a regular supermarket. Paula Shoyer eases the home cook in to baking with a nice introduction to baking – instructing cooks on the basic tools and pantry staples. She also gives us some helpful cooking tips to help with the process. From how to crack eggs, to baking in water baths – Shoyer explains the various tricks of the trade. In addition to the nice overview of the kitchen to help you, there are numerous photos to draw you in to each recipe. I know that the photo is often the deciding factor of whether or not I will try that recipe. Her photos even include some lovely step-by-step shots for some of the more intricate recipes. The first recipe I was pulled in to, were the Scones au Chocolate. The chocolate oozing out of the scone got to me. I had to make that first. The recipe and instructions were spot on. The Scones pleased everyone in the room. Later, I decided to try out something fruity. I turned to her rasbperry bars. I am always a sucker for raspberry bars and I had all of the ingredients in my house. I was also struck by her technique for the crust topping – which included shaving the dough on to the raspberry filling. So creative! When I set out to make the raspberry bars, I was once again left feeling happy. Paula Shoyer’s step-by-step instructions leave nothing out and are very easy to understand. The rasbperry bars came out perfectly, with no complaints. Overall, I would definitely recommend “The Kosher Baker” for someone looking for a baking book to ease in to. If you are looking for simple and easy to follow recipes that happen to be pareve, then this is the book for you. I am sure I will be turning to this cookbook when the holidays come around again, as there are so many recipes to pick from. I am sharing with you her raspberry bar recipe. I hope you will enjoy them as much as I did. Grease a 9-by-13-inch pan with some margarine. Place a piece of parchment in the pan that is large enough to go up the sides and hang over a few inches. Grease the top and sides of the parchment. To make the crust:Place the flour and sugar into the bowl of a food processor fitted with a metal blade. Process for 10 seconds. Cut the margarine into pieces and add to the bowl with the vanilla. (You can also make the crust by hand by cutting the margarine in to the dry ingredients with a pastry cutter or two knives.) Process or hand mix with a wooden spoon until the dough comes together. Divide the dough in to two parts, 1/3 and 2/3 of the dough. Wrap the smaller piece in plastic, flatten and place in the freezer. Take the larger piece and break it into pieces and scatter over the parchment. Press the pieces into the pan as evenly as you can. Place in the oven and bake for 15 minutes. Remove from the oven and let cool for 15 minutes.Use a silicone spatula to spread the jam all over the crust in the pan. Remove the other dough piece from the freezer, and using the large holes of a box grater, grate the remaining dough over the filling. Use your hands to spread the grated dough all over to cover the filling. Bake for 30 minutes, or until the edges start to brown. Let cool. Trim off about 1/4 inch of the sides and then cut into squares or long bars. I used Ina Garten’s recipe for the rugelach dough and then came up with my own filling. The rugelach came out super tasty and they were suprisingly easy to make. My fear of baking is slowly fading. In your mixer, using the paddle attachment, mix up the cream cheese and the butter until well mixed. Add the sugar, salt, and vanilla. Continue to mix on low speed. Slowly add the flour with the mixer running. Do not over mix the dough. The dough will be sticky. Turn the dough out on to a well floured board and roll it into a ball. Cut the ball into quarters. Wrap each quarter in plastic wrap and chill in the refridgerator for at least an or…or you could freeze the dough for future use. The dough works best the colder it is. While the dough is chilling, get your filling ready. In a food processor, chop the walnuts and chocolate until ground well. Mix in the brown sugar. I love my mini cuisinart. It’s petite,adorable, and cute. It was sitting lost and lonely in a cabinet behind my giant cuisinart. It should have a permanent place on my counter, but I dislike the clutter. Once the dough is chilled, we are ready to roll up some rugelach. On a well floured board, roll each ball into a circle, around 9 inches. Spread a very light layer of jam on to the dough circle. Do not add too much jam, as there will be too much oozing when baking. Sprinkle the nut/choc filling onto the jam. Cut the dough circle into wedges, around 12-16 equal wedges. I find it cuts best with a pizza slicer. Starting with the wide edge, roll up each wedge. 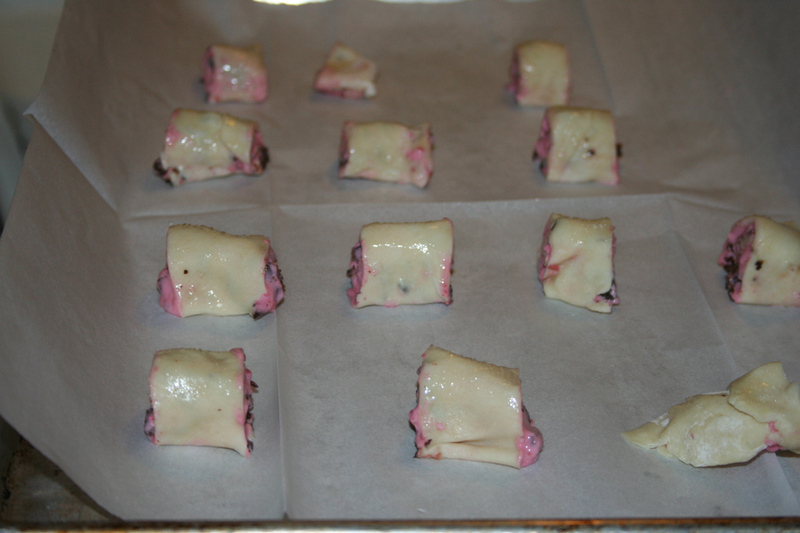 Put the rolled up rugelach on to a baking sheet lined with parchement paper or a silpat. Remove the dough from the fridge. Brush each rugel with the egg wash. Dust with the cinnamon/sugar mixture. Bake for 15-20 minutes until lightly browned. Cool on a wire rack. Be thankful that I am not including any nutritional information on this one.